hello friends, you all know what Farmville is. 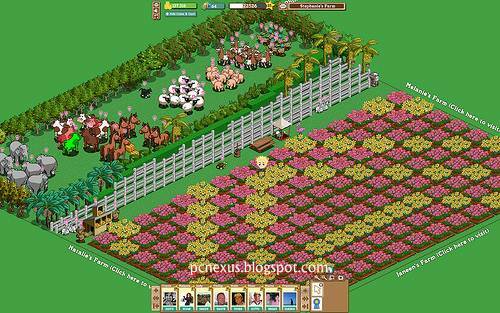 If you don't know then it is a social network farm simulation game for facebook web users developed by zynga.The total users of farmville are about 800 million.This games allows users to manage virtual farms which includes everything virtual that is virtual crops,virtual harvesting and virtual planting.Most fb users play it on pc.However it can be played on your android phone also..It can be best played on android 2.2 froyo,i can't say whether it will run on android 2.1.So here is a trick to play it on your android. step1. download flash 10.1 to your android 2.2 phone. step2. open up the browser and log in to facebook. type, about:debug in your browser's address bar and hit go.The browser will go back to same screen where you were on before. step4. now goto menu then click more and scroll down to settings. step6. choose desktop.This will trick facebook into thinking that you are accessing them from a pc or laptop and not from an android phone. step7. go back until you see the facebook page.Or you can go to it directly by entering address.Refresh your phone's browser and play farmville !!! i just tried, apps.facebook.com/onthefarm on my browser (LG optimus 1 p-500 with froyo 2.2) and it redirected and i got farm on my android. :) Great.. It's great to play farmville on android. What about on an android tablet? can you play farmville properlly on a tablet? yes Mr Ben you can play as farmville works on android.But your tablets should support flash 10 or later.